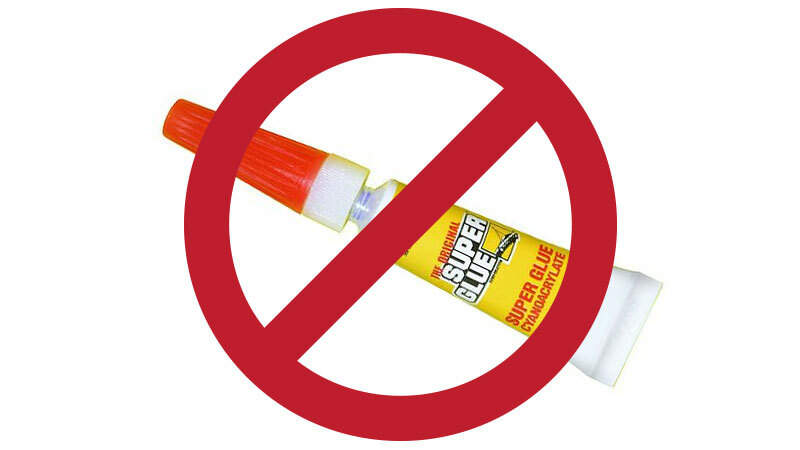 Musical Instruments and “Super” Glues – Never Ever! CA glue is an ingenious product for certain applications. It is commonly called Super Glue or Krazy Glue, among other labels. For orchestral or any musical instrument, it is dangerous and strictly taboo. A recent violin repair came in with bridge problems. The bridge was “loose” and had been superglued to the top. The result was a poor bond that failed and left a hard mess on the bridge and the violin finish. The bridge had to be replaced. Before this could be done, the CA glue on the finish needed to be removed. This is a tediously complicated and expensive task that is nearly impossible to accomplish without damage to the finish. The bridge is meant to be held in place with string pressure and must not be glued to the top. CA glue, used anywhere on instruments will cause damage that is nearly always permanent, and is unnecessary. Please never, ever use CA glue on your instrument. We also have band instruments come in quite often that have been super glued back together. Never a good idea! Super glue will never hold a post on or fix a tuning slide that has come apart. They must be soldered back together. Super glue is dangerous to remove and will also damage the finish on the instrument. Again, please never, ever use super glue on your instrument. The technicians at Paige’s Music are here to help you solve playing condition problems professionally, enhancing the sound of your instrument and playing. Bring it to us. We are happy to help!